On a visit to Jerusalem, Bruce Feiler has a revelation: The stories of the Bible occurred in real places — places he could visit today. So he sets out on a perilous ten-thousand-mile journey retracing the greatest stories ever told. From the base of Mount Ararat, where he meets a mysterious man who claims to have found Noah’s ark, to the edge of the Dead Sea, where he climbs salt pillars in the lost cities of Sodom and Gomorrah, Feiler discovers that the Bible still lives in the landscape. He visits the desert outpost where Abraham first heard the words of God, and has an unexpected encounter alongside the legendary burning bush. And finally he climbs Mount Sinai, where Moses received the Ten Commandments. In each place, Feiler eloquently explores how geography affects the Bible and how his journey has influenced his faith. 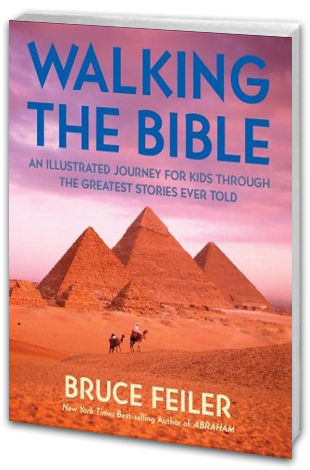 Illustrated with graceful maps and Feiler’s own photographs, WALKING THE BIBLE is both a heart-pounding adventure and an uplifting personal quest that will forever change your view of some of history’s most memorable events.